It’s Tuesday again so it’s time to STRETCH! I’ve been reading the communications this last week and noticed the call for chop plates in carnival. The definition was of plates that are 10-inches or larger. This set my mind off to consider the large pieces known in stretch glass. I teased Brian about having a large cake plate for the wedding cake and came up with the Imperial “wide panel” plate that was 15-inches in diameter and the Fenton #604 plate that can be nearly 17 inches wide. I’d call those really large chop plates! LOL! In fact, both items are made from bowls. So tonight, I’d like to show you some of the larger bowls known in stretch glass. 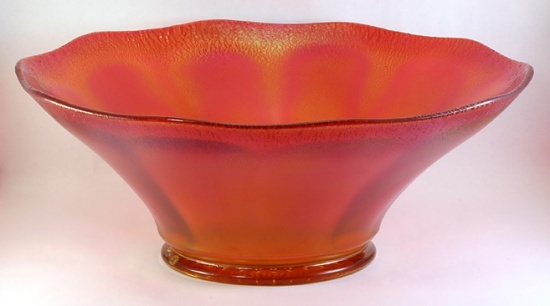 By far, the largest (and heaviest) bowl known in stretch glass was made by Diamond! We don’t know the number for this bowl, but it has optic panels and is usually 15 to 16 inches in diameter with a 6 ½-inch base. It is known in Diamond’s Blue Crackle (cobalt blue glass with a true crackle glass effect), Egyptian Lustre (black amethyst glass with multicolored iridescence), and Pearl (crystal glass with white iridescence). 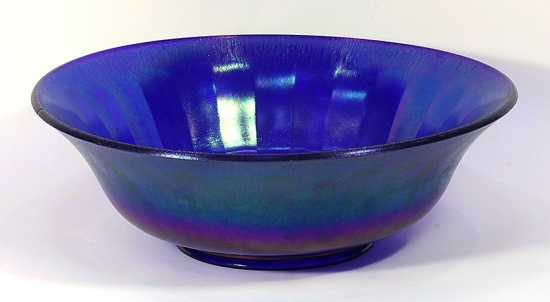 I’ve included an image of the Blue Crackle bowl. Fenton, Diamond and Imperial made true punch bowls which would be in the 12-inch diameter range. 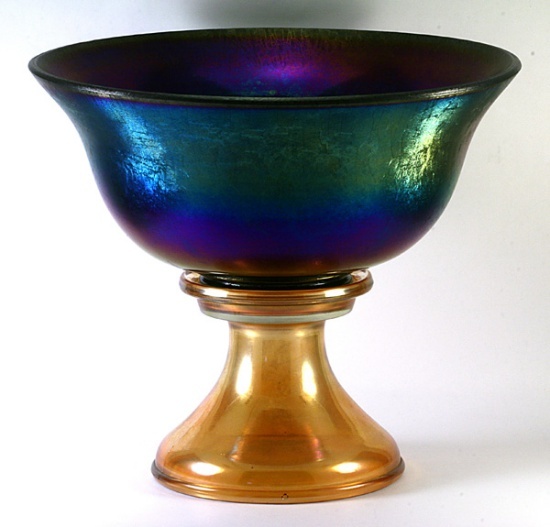 The Diamond and Fenton ones are nearly identical with 4-inch bases, but the Fenton #604 bowls often have no collar on the base, or the collar is straight sided. The Diamond bowls all have a collar and it is narrow. We thought that only the Fenton punch bowls had stretch bases, but we now know of two punch bowl bases that appear to be Diamond’s! I’m including an image of the Fenton #604 punch bowl on base in Florentine Green, and an image of the 12-inch Diamond punch bowl in Egyptian Lustre on one of the marigold bases. 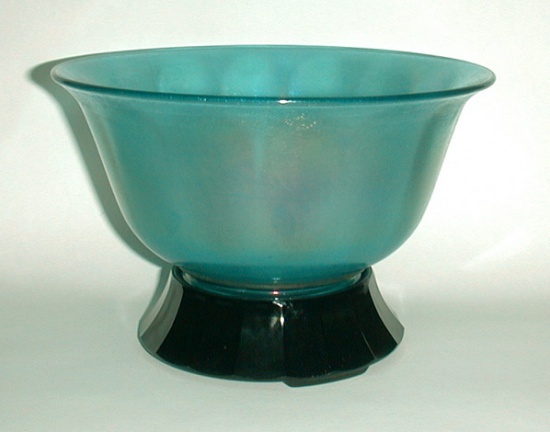 Imperial made two types of wide-panel bowls in the 12-inch size. The #695 bowl has a 5 3/8-inch base while the #6569 bowl has a 4 3/8-inch base. 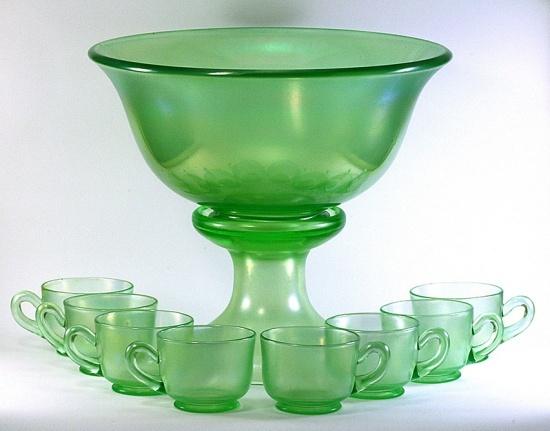 The Imperial bowls are most commonly seen in ruby, but pieces are known in Green Ice (teal) and Iris Ice (crystal). One of the rarest of the large bowls is an oval, two-handled piece. Apparently, the mold for this bowl was used by Northwood, but they don’t seem to have made any stretch glass with the mold. Fenton acquired the mold, #1563, and made pieces. There is only one Velva Rose (pink stretch) bowl known and I’ve heard that there is a Celeste Blue bowl among collectors, but I’ve never seen it! Do any of you have it? !